Sean Rafferty presents, with live music from violist Max Baillie together with Scandinavian folk musicians Erik Rydvall and Olav Mjelva. Plus the Modulus Quartet perform live. Sean Rafferty presents a lively mix of music, chat and arts news. 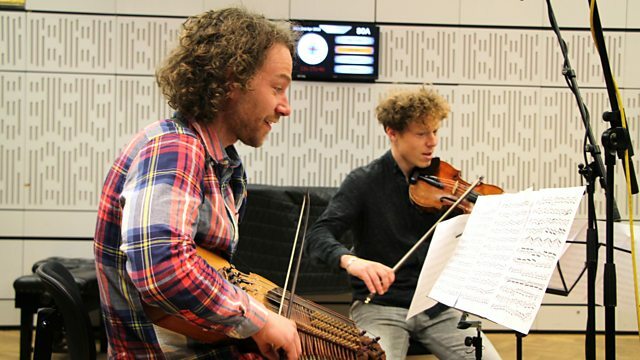 His guests today include Scandinavian folk musicians Erik Rydvall and Olav Mjelva, who together with violist Max Baillie perform works by Bach in The Old Church, Stoke Newington later in the week. The Modulus Quartet, a group dedicated to the performance of contemporary works, play live for us before a gig in an extraordinary setting: the Brunel Museum's Tunnel Shaft. Plus composer and conductor Carl Davis chats to Sean about conducting the Philharmonia Orchestra in Canterbury this coming weekend. Ensemble: Royal Academy of Music. Ensemble: Juilliard School Brass. Conductor: Reinhold Friedrich. Performer: Melvyn Tan. Orchestra: Orchestra. Conductor: Carl Davis. Chopin: The Complete Nocturnes and Impromptus: Angela Hewitt, piano. Bach: Bachanais - Music by the Bach family. Performer: Vilde Frang. Performer: Maxim Rysanov. Ensemble: Arcangelo. Conductor: Jonathan Cohen. Singer: Yaniv d'Or. Ensemble: Ensemble NAYA. Ensemble: Barrocade. Director: Amit Tiefenbrunn. Performer: Emanuel Ax. Performer: John Dalley. Performer: Michael Tree. Performer: David Soyer. Performer: Julius Levine. Mascagni: Cavalleria Rusticana - Norman, Giacomini. Performer: Olav Luksengård Mjelva. Performer: Erik Rydvall. Performer: Max Baillie. Performer: Olav Luksengård Mjelva. Singer: Joyce DiDonato. Ensemble: Il Pomo d’Oro. Director: Maxim Emelyanychev. Performer: Lorna Anderson. Performer: Pamela Helen Stephen. Performer: Mark Padmore. Performer: Stephen Varcoe. Choir: Collegium Musicum 90. Conductor: Richard Hickox.